Having previously covered the 1960s, 1970s, 1980s and 1990s in this section, as well as spotlighting the 91-years-young Bert Williams, we now come much more up to date by profiling the much-loved Matt Murray. Questions come from a variety of sources as usual but largely from Molineux Mix followers. 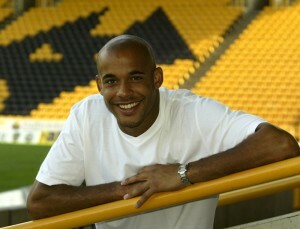 Matt at Molineux. 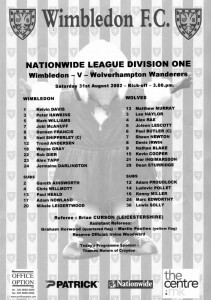 Picture taken from the Running With Wolves book in which the keeper was one of author Peter Lansley's chosen interviewees. A: My mum says I used to dribble the ball up and down the garden as soon as I could walk. I was fascinated by kicking it, picking it up and catching it. My earliest memory is when I was about four, playing football with all my cousins or brothers. They were all older than me, so when I played with them, they stuck me in goal. My first proper game, when I was eight, was for Lichfield Cubs and I played in goal. We won 6-0. A: My step-dad is from Wallasey and an Everton fan, so my first idol was Neville Southall. He was the first keeper I saw and I thought some of his saves were unbelievable. 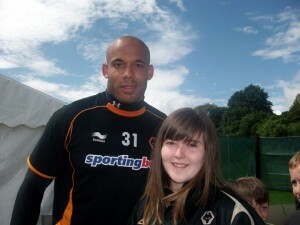 I signed for Wolves at nine and we used to get free tickets to games, so I saw a lot of Mike Stowell and idolised him. As I got older, just because of my physique and obviously because of my ethnicity, I used to look up to Shaka Hislop and David James. People used to liken me to them for obvious reasons, so they have been the keepers I’ve idolised most. I lived in Lichfield and my step-dad used to take me to Wolves for training every Monday and Tuesday night. It was quite a commitment. He came in straight from work and we had to be there for six o’clock. I always like to thank them for the help they gave me. A: It was away to Wimbledon in the League, at Selhurst Park just before they became the MK Dons. There were more of our fans there than Wimbledon fans. I was just 21. We lost 3-2. A new name to conjure with.....(try clicking on image to enlarge). A: I actually felt it was quite old because I had waited so long. I nearly made it into the first team when I was 16. I’d been playing in the reserves because Hans Segers had been injured and Stowelly had flu. I played in the reserves midweek and was expecting to play for the first team on the Saturday but Hans was put through a fitness test I didn’t know about. I turned up expecting to play but Hans passed his test. In some respects, it was good I didn’t play because I wasn’t ready. But I then had injury problems and ended up waiting five more years. A: It was very difficult at times because I always had serious injuries. I didn’t just get a niggle, it was always a big one. I got through because of the great support I had from everybody – family, friends, the club, fans. That kept me going. There’s no better feeling than running out in front of a full Molineux. I used to draw on that to keep me going when I was having to work hard on the exercise bike or the weights, or was in pain after an operation. That’s what keeps you going. If I’d been older and starting to get bad injuries, perhaps that would have been more difficult. I had these injuries right from the start when I was young and just had to deal with them. A: I’d faced Michael Brown earlier in the season when we played at Bramall Lane and drew 3-3. He scored a penalty and went to my left. He’d been taking penalties all season and always went that way. We were aware the final could go to a penalty shoot-out and, if so, we knew he’d take one. So we worked on it in training, thinking he might take the first one and, if I could save that, it would be a massive psychological bonus for us. Obviously, the penalty came during the game, so I left him more space to the left to encourage him to go there even more. As soon as his head dropped, I went early and luckily it was a nice height. 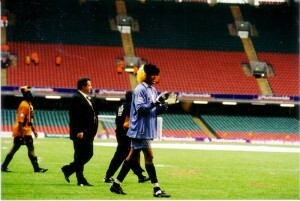 Bobby Mimms and Dean Sturridge had practised with me for some time. I had a wig on at the end of the game, I was looking for people in the crowd. I knew Ade Akinbyi was there but was also looking for family members. It took a while for the fact that we’d won to sink in. Then someone told me I had got the man-of-the-match award. It was the furthest thing from my mind. I don’t think anyone knew there was going to be one. A new hairstyle for the big day in Cardiff. Picture taken from Running With Wolves. We’d worked so hard during the season and had the heartache of just missing out the year before. It was a whirlwind season for me. Everything seemed to go right. I also remember thinking I couldn’t get drunk that night because I was having an operation the following morning. I’d been playing with a double hernia for three months. I needed to get it done that day, otherwise the surgeon wouldn’t have been able to fit me in for another three weeks. A: Yes, I remember that. I came and took a corner. I was very positive about going for crosses. It was something I worked on in training. Everyone knows I don’t kick the ball as well as most keepers, so I had to bring things into my game that would give me an edge, Obviously, we all have to keep the ball out of the net but I focused on taking crosses and getting the ball out quickly. Both the full seasons I played, we had flying wingers, like Shaun Newton, Mark Kennedy and Michael Kightly. I just made my mind up I was coming for the corner against Newcastle. It was an outswinger. I took it near the penalty spot and threw it straight out to Newty. He played in Colin Cameron, who squared and Mark Kennedy hit a sweet shot. That was part of my game. As soon as our wingers heard me shout “keeper’s ball,” they were off. A: I’ve got on with all of them. Mark McGhee gave me my first contract, so that was special, but I had a lot of injuries under Colin Lee and Glen Hoddle. Dave Jones was great to play for. He gave me my debut but we didn’t always see eye to eye at first. He seemed to have an opinion about me. He obviously thought I had a lot of potential and wasn’t maximising it; I wasn’t fit. I was living the high life with some of mates, like Robbie Keane, who were doing well in the game. I was going to night clubs but maybe I was going out when it wasn’t right. I was having problems with my knees. He read me the riot act, so I asked if he would let me go and have an operation on my knee, which he did. We had some big bust-ups. He really caned me on occasions. That first season with him, I spent the whole time on the bench and the next season I played all the time. I don’t hold grudges, nor did Dave Jones. Playing for Mick McCarthy was the time I enjoyed the most. I’ll never forget the first time I played for him. I said I wanted someone on the six-yard line at set-pieces to head it away. He said: “If the ball comes on the six-yard line and you don’t come for it, I’m not saying I will beat you up but I’ll hurt you enough to make sure you come for the next one.” He told me there was no way I was having anyone on the six-yard box to head the ball. Mick is very good at getting the best out of people. He’s very fair. What you see is what you get, a very honest guy, and he doesn’t mind you making mistakes as long as you’re honest. I’ve got so much time for him. He has been brilliant for me. A: Obviously, I played behind a lot of good defenders but, as a unit, probably the lads in the play-off final. We had the experience of Paul Butler, everyone knows about Joleon (how good is he? ), Denis Irwin at right-back and Lee Naylor at left-back. They were a brilliant combination. A: Not laugh! I didn’t find any goals against me funny. There are some that have really disappointed me. Against Southampton in the quarter-final of the FA Cup, I should have done better. I thought Beattie was going to kick it….I just took my eye off it and it squirmed under me. That upset me because we were having a great Cup run. There was also a goal against West Brom when we lost 3-0. It was a header by Kamara which I should have done better with. I should have saved it. I hate letting in bad goals, especially in big games. In the company of young fan Taila Miller in Ireland. A: Probably Alan Shearer but Andy Cole always seemed to score against me as well. A: The play-off final, obviously, beating West Brom 1-0 and probably beating Newcastle in the FA Cup. A: I played for England under-16s and was selected for the under-18s and under- 20s but was injured each time. I won five caps for the under-21s and had the scout for the senior squad, Ray Clemence, coming to watch me. They were keeping an eye on me but I kept getting injured and never got in. 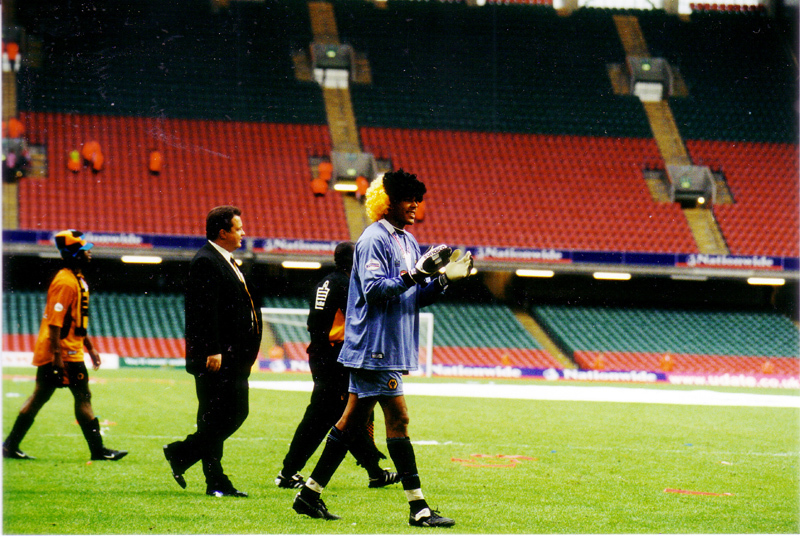 David James was in the England team at that time and Scott Carson was in and out. Nobody had actually claimed the position as his own. Paul Robinson was also around. It was just as James was coming to the end of his time as no 1. A: Ishmael looks promising – he’s highly rated and a very talented player. I also like the young goalkeeper coming through, called John Flack. He’s only 15 or 16 but very impressive when I watch him. He’s going to be the next Wayne in my opinion. He’s a very good kicker and understands his position so well for his age. He watches and learns from the senior boys. I rate him. Jack Price is another and Ethan Ebanks-Landell, if he can keep himself fit, is a good athlete. I remember him coming and training with the first team and thought this boy has got something. But he’s just struggling with his knee at the moment. * Part two of this feature will follow later in April. Posted on: Friday, April 15th, 2011.